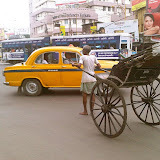 Never having been to Kolkata was an ever-nagging, poking blurb I lived with since art school days. Native classmates or colleagues would dissappear around puja (Dushehra) and would return unwillingly, with a thing or two to say about the city that egged me on to plan a trip. Fifteen years of postponing went by. So when a work related opportunity knocked on my procrastinating skull, I reached for it, with an eye on a weekend spent galavanting on the streets of a heritage city, polishing off quintessential street food I had heard so much about. There was so much more. I was amidst sprawling bookstores reflecting an intellectual people’s priorities, passion for football in a crowded maidaan opposite Victoria Memorial, an agitated narrator in Birla Planetarium reprimanding cell users during the show, zealous taxi drivers wanting to guide me through the city across both the iconic bridges, mobile time capsules like the trams, foot-driven rickshaws and the undying, ever-available yellow taxis. I could have well spent a week here and still not scratched the surface of what heritage city can offer a first-timer. High strung colleagues invited me with outstretched arms and swore by the city. Lunch time at Acharya Jagdish Chandra Bose road has a plethora of dishes made right there on the pavements, ranging from Dosas to Fish and eggs with rice. After a gluttonous session at K.C. Das, a waltzed down the flea market from Esplanade, along Jawahar Lal Nehru road. Victoria Memorial reminded me of sections of the British Museum and the national gallery on trafalgar square. The exhibits here, 18th century paintings of Indian landscapes by European historians, surely deserved better lighting though. Despite the people thronging, the compound was clean, unlike the unmanagable Taj. I tweeted my walks starting from my hotel on Elgin road to Park street, to Esplanade back to my hotel. After work hours on Monday, a colleague took me home for dinner to South City, on Prince Anwar shah road. We checked out South City mall, shaped like a boat. Our first course started with some unmissable street food called churmura on Camac street. We binged on at a local sweet shop. The evening whizzed past and I found myself waking up at 4 am to catch the morning flight. A trip cut short with so much more to see, I returned with a spearing thought of doing this again. College street, Kalighat… I’ll be back. There’s surely a reason for the happiness index to be on the higher side here. One serious plea to the administrators of Kolkata- Please bring CNG to the city. Kolkata is a treasure on its own and it deserves clean air. Once this rolls in, other incremental improvements will follow. Nevertheless, still looking forward to getting in here again. Enough said, time for the pics. This is an open folder for more, on another trip some day. finally! :-). pls tell me you had futchka, jhal muri, mughlai roll at new market, mutton cutlet and tele bhaja. did u try the cakes at flurry's? dont know if it still taste the same…but once upon a time it was divine. None of these- sadly, despite being out on the streets all day. Was alone and two days is way too less for Kol anyways. I missed more- College street, Science city… ouch. Some other day… with more time.